This morning I headed to Fifth Avenue for my morning walk. I love strolling the pedestrian avenue before the stores and restaurants open. Every morning I pass walkers, joggers and runners of all ages, and there is always a great feeling in the air as Playa del Carmen comes to life. This morning, however, something was different. As I approached Fifth Avenue, I was met with a different view from the normal wide, empty street. Runners of all ages were streaming along ‘La Quinta’, smiling and laughing. I have seen a few fun runs take place in Playa during my time here, including the half marathon, which was held in October. But this run looked very, very different from the others I had seen, and I have to say, it looked like a lot more fun. Runners were covered in blue and gold powder. It turned their hair a wacky shade and transformed their previously white t-shirts into colorful creations. Most runners wore colorful shades and some even dressed in colorful tutus, like athletic ballerinas. 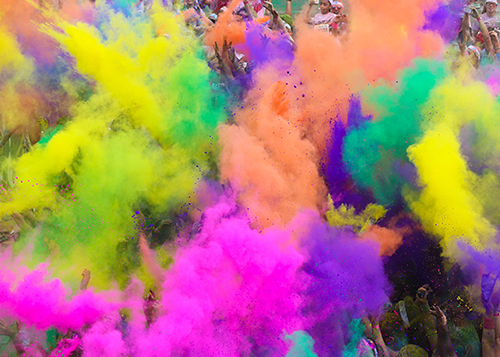 Colorful powder filled the air, creating a festive atmosphere. People of all ages, shapes and sizes were running and walking; children as young as two ran alongside their parents having the time of their lives, and even furry friends pounded the pavement! What a wonderful idea, I thought as I walked along the avenue in the opposite direction. I came across a late finisher running along a section of Fifth Avenue, which looked like the ‘yellow brick road’ from the Wizard of Oz. Further along, once all the runners had passed, I came to an empty stretch of Fifth Avenue, all but deserted but for the bright blue powder which covered the ground, looking like something out of ‘Smurfland’. It was great to see so many people out in force for the Color Run in Playa del Carmen, a creative, exciting event which encourages health, fun and friendship. I will definitely be keeping my eyes peeled for information on more Color Run events with the hope of participating. Maybe next year it will be me covered in colored powder and painting the town blue, yellow and red!